It's a rainy day as I make my way to the studios in Maidstone. I'd allowed plenty of time to get there and about 1.5 hours to do the make-up and get ready. I wasn't due on location until 14:00, for a shot start at 14:30. The Sat Nav gets me there on-time (I'd already checked it out with Google Street Map, so already knew the turning I was looking for). The studio seems deserted, I suppose as its a Sunday, not much is going on. I press the intercom button on the barrier, announce who I am and why I'm here and the guard lets men in. I enter the building, which is somewhat cold and has a hospital smell. I'm in the process of talking to the security guard, when the production assistant appears from one of the corridors, clutching a cup of coffee. We chat for a few moments, confirming the timings and specifically when the taxi will arrive to take me to the shopping centre. I return to my car to get my make-up and costume and then get shown to my dressing room. Again my first impression are its cold and damp, like the eerie feeling of unnatural silence your get if you've ever been back to your school (or office) at the weekend. The assistant brings me a coffee and I start preparing to apply the make-up. 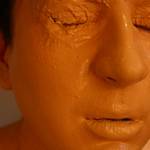 I use flesh coloured liquid latex, which I apply in layers with a small sponge (well I get through about 4 or 5). I usually start around the eyes as this is the most tricky as you have to wait for the Ammonia evaporate a little; otherwise it makes your eyes water and this ruins the make-up. Everything was going well, I'd applied about 5 layers of latex and had about half an hour to spare. I was gradually moving the latex closer to my eyes, something I'd done many times before, when it decided to flow into my left eye. No matter what I did from this moment on, the latex kept going into my eye causing it to water and sting more and more. I decided to remove a complete section and try and re-build it, but my eye keep watering and a spilt appeared in the latex in the corner that would not seal. Well at the point I was panicking a bit; although CPR dummies can appear a bit "beaten up", being a perfectionist I wanted it to look perfect on TV. I decided to do some repairs with tissue paper, something I had done a few times before, usually to give the effect of a battered mannequin, but I thought I'd give it a go. I dried the area and finally managed to patch up the split. If you look at the pictures you'll probably think what was all the fuss about, it looks fine, and yes it does but I knew it could have been better. 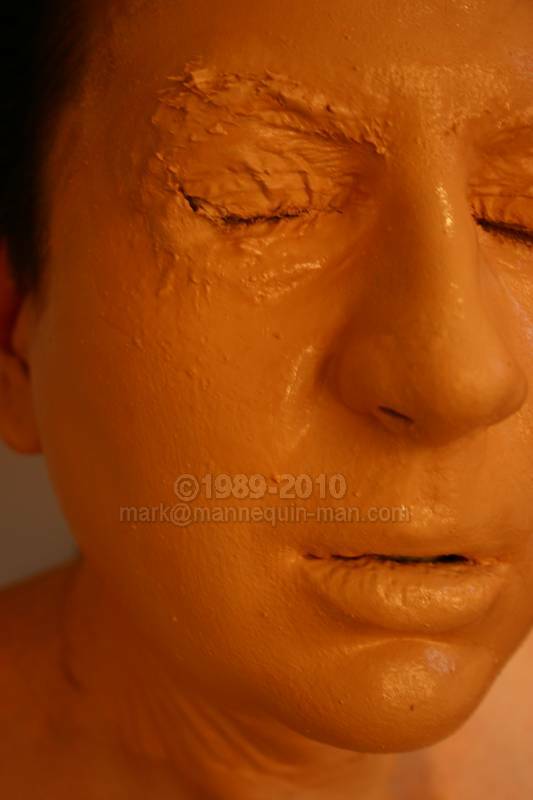 I've since refined my technique and now I don't go right up to the eye with the latex but fill in with a similar coloured pan stick. I'd used up all my time and taxi was due, I then quickly get dressed into the cpr dummy costume and walk out into the reception area. The taxi then takes a further 10 minutes to arrive, but we still had loads of time. We arrive at the shopping centre in the loading bay, and then walk up through the service access ways to where the tent is set-up. We then quickly walk to the tent in the hope that no one notices an animated cpr dummy. The director explains what he what he wants me to do and it all seems clear. I suggest that it would be better if I were to lay on the trolley rather than on mats on the floor as it will make it easier for people to do the CPR without having to kneel on the floor, and easier to film as they will be higher. I take my place on the trolley and we do a dry run so I know when I'm suppose to go "boo". Then some of the crew are sent out to find some people who want some CPR instruction; this proves difficult as they return initially empty handed. A few moments later, after being a bit more persuasive, they find their first customer. All the reactions are excellent, and they have no idea I'm not a real cpr dummy.